Genetic traits: Imps are highly intelligent and wise beings that thrive upon their use of magic and their ability to move with nearly unparalleled ease. Other races consider them quite ugly and repulsive. They are easily struck down when hit and have below average strength. 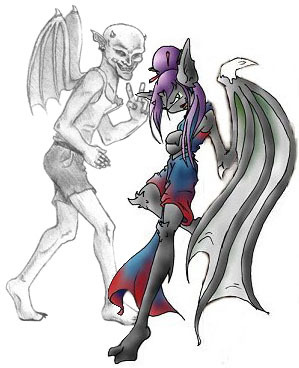 Physical description: Imps have wings like faeries, they are about 2 feet tall and have tiny pointed horns. Their skin is bluish in colour and are very evil.